TS Edcet Notification released on 11-06-2017. ( Telangna State Education Common Entrance) Test known as TS EdCET-2017 notification and examination details announced by Osmania University, Hyderabad on behalf of TSCHE. Applications are invited from candidates who intend to take admissions into B.Ed (Bachelor of Education) regular 2 years duration course offered in Universities and affiliated colleges of education in Telangana state for the academic year 2017-2018. Last date of Application Without Late Fee:06-07-2017. Last date for Application with Late Fee of Rs.500/-:08-07-2017. Hall ticket download:- - . Date of TS EDCET Exam 2017:16-07-2017. Candidates satisfying the following requirements shall be eligible to appear for TS Ed.CET-2017 for admission to 2- year B.Ed Course. i. The candidate should be of Indian Nationality. The candidate should satisfy ‘local’ / ‘non- local’ Status requirements as laid down in the Telangana Educational Institutions (Regulation of Admission) Order, 1974, as subsequently amended. ii. Educational Qualifications : Candidates should have passed or appeared for qualifying examination (a) In any Bachelors Degree i.e., B.A, B.Com, B.Sc, B.Sc (Home Science), BCA, BBM/BBA or in the Masters Degree, securing at least 50% aggregate marks. (b) Bachelors in Engineering or Technology with Specialization in Science and Mathematics with 55% aggregate marks or (c) Any other qualification equivalent thereto. (d) However, for candidates belonging to the reserved categories Viz., SC/ ST/ BC and other reserved categories should have secured 40% Marks in the qualifying examination. (e) Candidates possessing MBBS/ BSC (AG) / BVSC/ BHMT/ B.Pharm and such other professional and job oriented degree courses Viz., LLB are not eligible for admission into B.Ed Course. (f) Candidates possessing a Master Degree without having undertaken undergraduate study are not eligible for admission. iii. Age limit: The candidate should have completed the age of 19 years as on 1st July of the year in which notification is issued. There shall be no maximum age limit. 2. Choosing of Part-C subjects (i.e. .methodology) for entrance test is at candidate’s risk. Subject eligibility will be subject to verification later at the time of admission counselling. 7. Note: As per the GO MS.No: 13 dated. 27/5/2017, the candidates possessing M.B.B.S / B.SC (AG))/ BVSC/BHMT/ B.Pharm and such other professional and job oriented degree courses viz., LL.B are not eligible for admission into B.Ed course. 8. Candidates will not be allowed into the Examination Hall after 11.00 A.M on the day of the Examination. 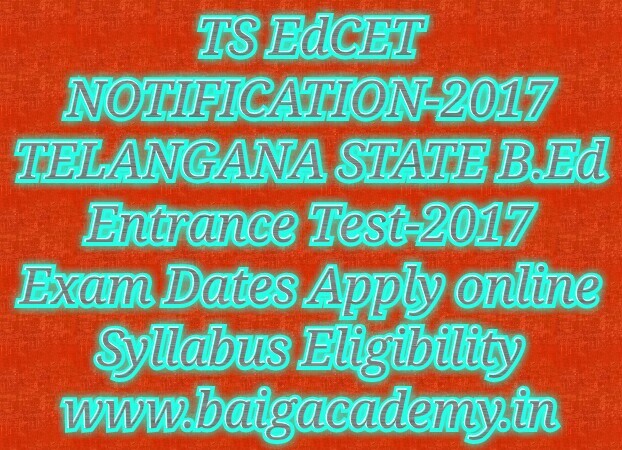 More Updates keep visiting this site for Latest Updates about TS Edcet-2017.